Barbie Jeep Racing is one of the most dangerous off-road sports per dollar you can possibly get into. It is also the most FUN. How else can you get this much fun out of 15lbs of plastic! The concept is simple. 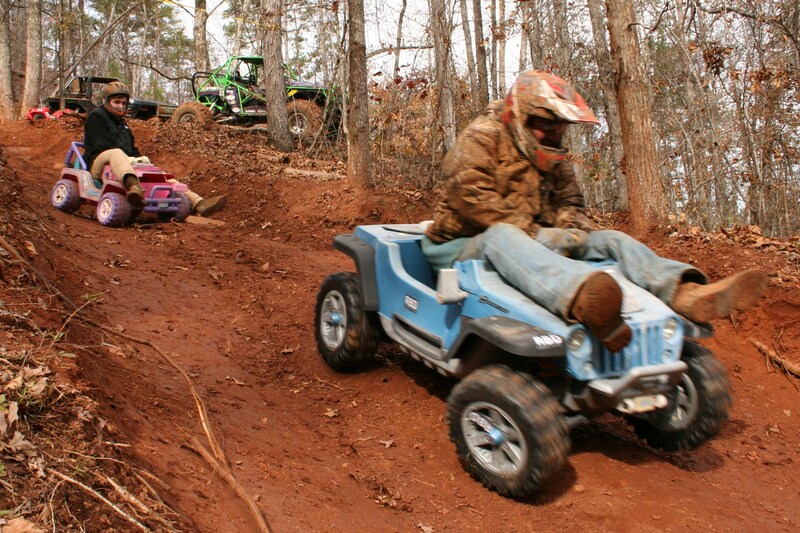 Take a power-wheels vehicle, break off the drive gear, go to a steep hill, climb aboard and watch the madness unfold. Barbie Jeep Racing is one of our favorite off-road past times. These things can be had for FREE on the side of the road. Believe it or not, People actually throw them out not realizing their full potential. 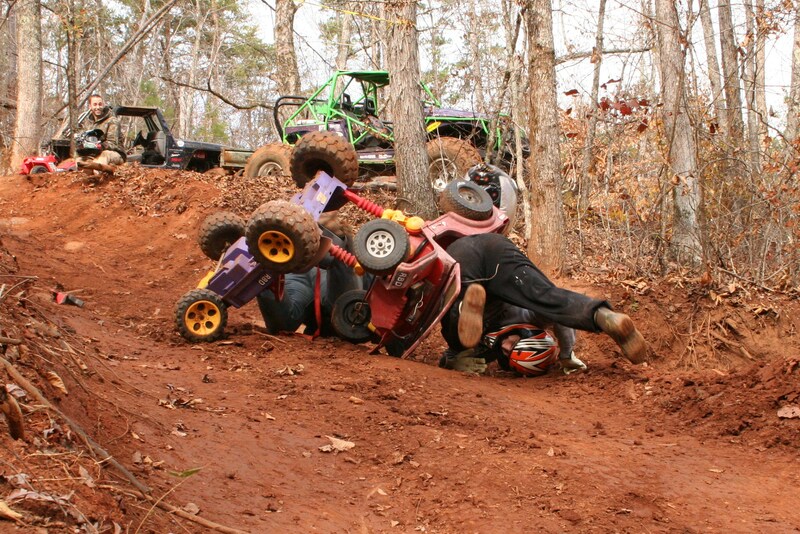 The 2010 RBD event that took place at Morris Mountain ORV in Heflin, Alabama is where we got our first taste of Barbie Jeep Racing. We took home 1st place and are now hooked! Be watching for us to have more downhill barbie jeep races at the off-road events we film in 2011. For now here is how things went down. Eight Racers dragged their trusty steeds to the top of the Los Primos trail bypass and prepared for battle. First off was the huge Hurricane against Lee Wolfe. After a few crashes the Hurricane made its way across the line first. Next up was Ricky B. in the Pirate 4×4 dune buggy vs. the Red Rocket. They crashed right out of the gate. The collision ended Ricky’s day and sent Red Rocket on to the next round. Next up was Yours Truly in the smallest Jeep of the race against the purple Jeep. I got off to a slow start but smoked by my competitor as he tumbled down the left side of the course. Last race of Round 1 was Will Carrell vs. the Shuntwerks Jeep. Will had a hellacious wreck at the bottom of the course but still managed to cross the finish line with only 3 wheels left on the jeep. The Shuntwerks Jeep took two hard crashes before it finally made it across the finish. After Round 1 we had 4 racers still in the running. The first race was the Hurricane vs. Red Rocket. The huge Hurricane launched the got off to a blazing start thanks to its size and heavy rider. This extra weight backfired on the rider as he missed the turn and was catapulted into the woods just above the finish line. The Red Rocket recovered from an early rollover at the top of the course and decided that laying on the jeep was a better approach. His fast thinking let the red rocket just barely beat the hurricane by inches. The second race was Matt Myrick (Me) vs. Will Carrell who had borrowed a rig since his was laying at the bottom of the track in pieces. I got off to a rocky start as I rode the left embankment of the course. To my surprise I rode it out on 3 wheels and took the lead. I was able to pilot my plastic machine down the course unharmed as Will wrecked behind me on his rental rig. This was it the FINAL ROUND was here. The two smallest little red Jeeps of the bunch were the two left standing. Myself and the Red Rocket Jeep sat at the top of the hill with our hearts pumping and thoughts of greatness running through our ringing heads. John G. counted us down to the start of the race. With every number my heart pounded harder. Three, two, one, GO! For a moment all you could hear was the screams of the bystanders and the rolling of the plastic wheels as we battled it out to the last second. I managed to make the dreaded left hand turn at the half way point of the track as my competitor lost control and tumbled his way to a stop. I ran through the yellow caution tape that guarded the finish line at breakneck speeds. There I was, a Rookie to this great unknown sport. A sport where an average Joe can show up on any given Sunday with a kids toy and a set of ca-hones, Only to leave with a couple bruises and a memory that he will remember for a life time. Bruises are temporary, First Place is forever. I accepted my prizes which came out to $12, some RBD stickers, a Burger King Gift Card, and a 15% coupon to Blue Torch Fabworks. It doesn’t seem like much but If I had it to do all over again I would have raced for a penny. This was a great way to end a great weekend of wheeling & celebrating Ricky’s 21st birthday. We dusted ourselves off and We loaded what was left of our fisher price chariots into the bed of the truck and made our way back to camp. If you want to take on this epic challenge, then we will see you next year at Morris Mountain ORV for RBD 2011. Until then enjoy some of the footage. Don’t forget to check out all of our Youtube videos & Subscribe as well as follow us on the Busted Knuckle Facebook page.